Lisa Fathers is Director of Teaching Schools and Partnerships for Bright Futures Educational Trust based in Greater Manchester. As it is the start of Place2Be’s Children’s Mental Health Week, here Lisa explains some of the interventions she has put in place to promote the mental and physical health of her pupils. Thankfully within the education arena the mental health and wellbeing of young people has become increasingly recognised as just as important as physical health. A wide variety of recent independent and government funded reports and research on this subject suggest a growth in the rates of mental illness in young people in our society today. I believe mental and physical health are intrinsically linked. The more we encourage pupils to be active, the more robust, resilient and engaged they become. At BFET we have been involved with the GM Mentally Healthy Schools Programme and as Youth Sport Trust Members we have really encouraged self-care. Our commitment to Mental Health First Aid has underpinned all this too. The recently published Sport England Active Lives and Young People Survey presented data for children and young people in school years 1-11 (ages 5-16) in England for the academic year 2017/18. To explain, current Government guidelines set out that children and young people should get 30 minutes of their daily physical activity during the school day and 30 minutes outside of school. The report found that just over one third of the 130,000 pupils who took part in the survey do less than an average 30 minutes a day. Long before this report was published, we introduced an initiative within GM called The Daily Mile in which our pupils do just this. They walk, jog and even skip a mile during their school day. I firmly believe this not only helps foster and encourage an awareness of the benefits of physical activity to our pupils but also helps their mental well-being. Greater Sport, the Youth Sport Trust and the Daily Mile work in partnership along with the GM Head teacher Alliance for PE, Sport and Health and this really helps to ensure a joined up approach to strategy. The Youth Sport Trust supports and encourages schools and teachers to place more emphasis on maximising the impact of PE and Sport and encourages schools to improve the quality of physical activities they do. As a strong advocate of the principle that prevention is better than cure, I’d encourage all teachers to adopt more initiatives that encourage physical activity and mental agility. Health Education England’s principle that a stronger focus should be placed on wellness rather than illness strongly resonates with me. This principle is embedded into their social prescribing work and needs to be front of mind as we help our young people to navigate the often stressful waters of academic pressure and the shifting expectations that society places upon them. To enable the benefits of social prescribing to be utilised within schools and beyond, The New Economics Foundation (NEF) Five Ways to Wellbeing (2008) is the perfect tool. NEF’s Five Ways to Wellbeing was developed as part of the government’s Foresight Project on mental capital and wellbeing. The five evidenced based activities are: Connect; Be Active; Take Notice; Keep Learning; and Give. 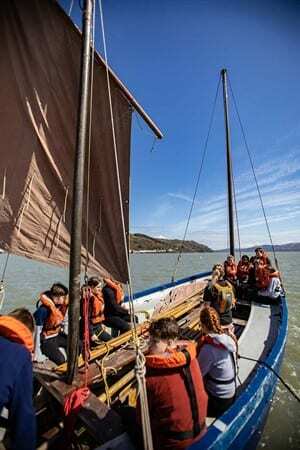 These activities are in perfect synergy with the work that I’ve done for many years with The Outward Bound Trust and their residential experiential learning programmes my pupils attend. Connect: relates to social relationships and connecting to peers and adults as this is critical for promoting wellbeing. Within a residential setting this activity happens as Outward Bound® instructors guide pupils and teachers to engage in a wide variety of outdoor activities together in teams. Be Active: regular exercise is associated with lower rates of depression and anxiety. Every day at Outward Bound sees all participants do activities such as swim, jog, walk, canoe, climb and scramble in stunning wilderness environments. Take Notice: encourages everyone to have an awareness of their surrounding and to pay attention to the present moment, others and the world around them. This enhances self-understanding and allows young people to make positive choices based on their own values and motivations. I’ve witnessed this often when a school group reaches a mountain summit and the instructor encourages pupils to breathe deeply, enjoy the view, and notice how far they have walked or climbed. Keep Learning: a mantra embraced by all teachers, this is specific to setting goals in either formal or informal learning environments and increases self-esteem and social interaction. 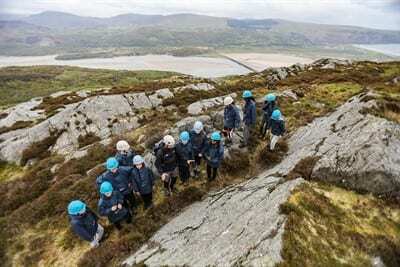 In an outdoor learning environment setting goals or tasks for teams really engages pupils. I’ve seen the benefits that raft building has on students as they grapple with wood planks and plastic barrels to create their end goal of a vessel that will float and carry the group across a lake. Give: this encourages students to be actively social and part of a group or community. Giving, helping and sharing with others is proven to engender feelings of happiness, self-worth and positive life satisfaction. This can be as simply as carrying a backpack for a member of their group who is struggling to get up a mountain or as complex as a community engagement programme where the whole school plants flower beds in a nursing home. Whatever interventions you choose to actively engage with at your school, be it the Daily Mile or an annual outdoor residential programme at Outward Bound or a combination of the many options available both within and out of the school environments I’d urge you to set these up. The benefits are multiple, long lasting and far reaching and will have a positive impact on the mental and physical health of our next generation. Nothing makes you feel quite as good as getting outside so this week get up, get out and enjoy! Take a look at our free Mental Health and Wellbeing taster courses to find out more about how Outward Bound could help your school.